Spain has so much to offer as a holiday destination – from the mainland to the islands that make up the Canaries, Balearics and beyond. It caters for families with little ones, it is the perfect place to soak up the sun with your partner or to party from dusk until dawn with your best friends. 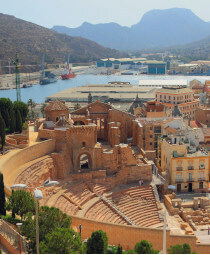 Between having a siesta and a fiesta, you’ll find there are so many things to do in Spain. This is why you need to plan your time before you visit, to ensure you make the most of every second. 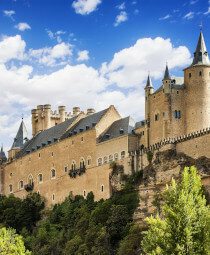 Spain is among the most popular holiday destinations in Europe. 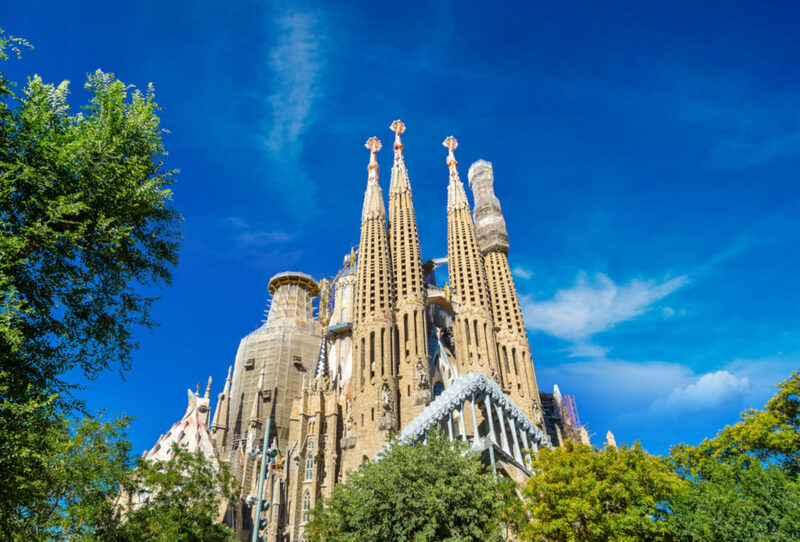 It’s home to world famous islands, including the party capital Ibiza, and must-visit cities including the cultural coastal metropolis of Barcelona, the capital Madrid and the film set that is Seville. It’s also one of the sunniest destinations on the continent and known around the world for its mouth-watering cuisine and seemingly never-ending sandy coastlines. Spain is one of the safest countries in the world. According to gov.uk, more than 19 million Brits visited the country in 2018 and the vast majority of these trips passed without incident. However, as with all travel, it’s important to have insurance, in case you should you need it, and to keep your wits about you. It can get incredibly hot, so make sure you wear a high factor sun cream and drink plenty of water throughout the day. Unless they are essential, leave your valuables in a safe. It’s also worth ensuring that you’re aware of any local laws or customs, so that you don’t get caught out. For example, in some parts of the country you can receive an on-the-spot fine for drinking in public. Major tourist destinations are connected by a network of high-speed trains. Most locations can be reached in this way in under three hours and all capitals are connected to Madrid. There are also ports so you can travel by boat, especially to the Balearic and Canary Islands. The average cost of accommodation in Spain is €49 per person per day. La Sagrada Familia is one of seven masterpieces from Spain’s most famous architect Antoni Gaudí to become UNESCO World Heritage Sites. It became his final resting place as well as being the most visited monument in the country. You’ll find it in beautiful Barcelona, a city he spent years living in, surrounded by much more of his work. Although it dates back to 1883, it actually remains unfinished to this day. It’s due to be completed in 2026, one hundred years after his death. 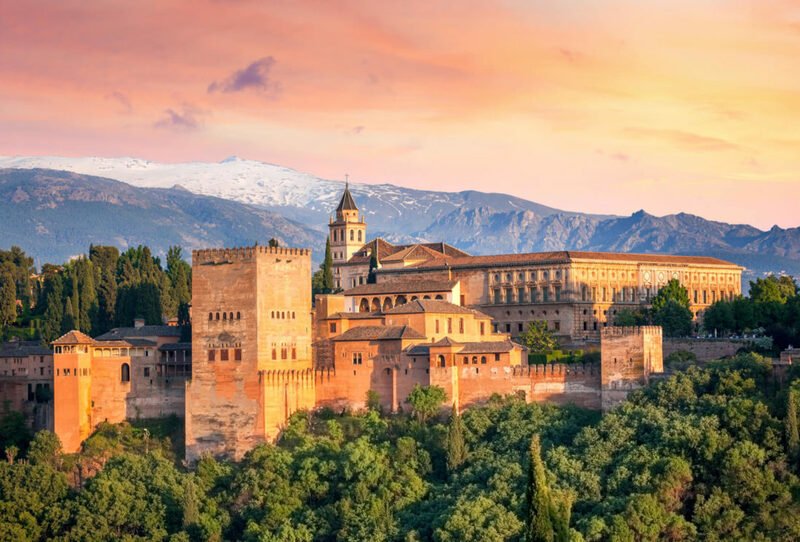 Situated high above Granada is this Moorish palace, a beautifully-preserved example of Islamic architecture. The name of this UNESCO World Heritage Site comes from the Arabic for red due to the colour of the walls. 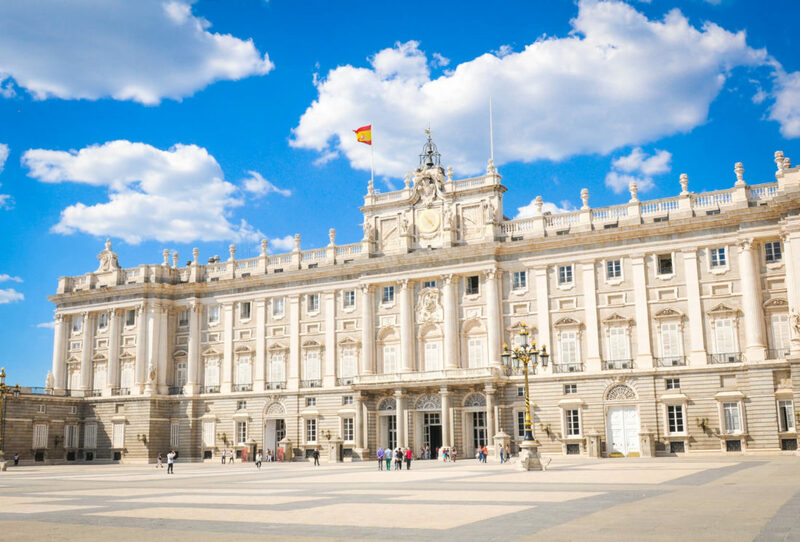 Spain’s capital is home to the largest Royal Palace in Europe. It dates back to 1764 and is the official residence of the country’s royal family although it is only used for official events and ceremonies. Inside there are more than 3,400 beautiful rooms and the main staircase which has 70 steps. There is an impressive collection of art throughout the palace including masterpieces by Goya. Outside, the Changing of the Guard takes place twice a week. Whether you want to feel the sand between your toes as you walk along the coastline, or would prefer to lay down your towel and soak up the sun, you’ll want to find the perfect beach. You’re in luck because this country is known for having some of the best in Europe. 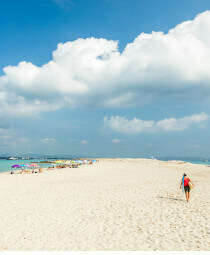 Across more than 5,000 miles of coastline it has more Blue Flag beaches than any other country. The smallest of the Balearic Islands is known for having a coastline that is the epitome of paradise and often compared to the Caribbean. The azure water laps soft, sugar white sand and is crystal clear, perfect for spotting the colourful fish that dart among the vibrant reefs. There is little development around the north coast beaches such as this one, allowing it to retain its natural beauty. You may have heard this one called The Cathedral Beach. 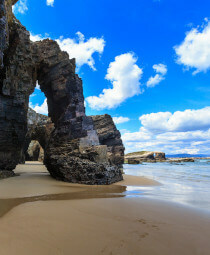 It’s situated in northern Spain near Ribadeo and gets its name from archways that have been formed by the Atlantic Ocean. It’s free to visit but you’ll have to book a month in advance. Numbers are limited to 5000 a day to protect this National Monument. This part of the coastline has been rated among the best city beaches in Europe. 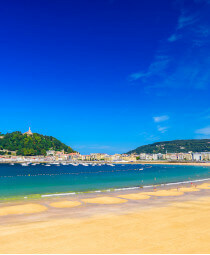 The Urgull Mountain and Igueldo Mountains provide the backdrop to this ‘Royal Beach’ which got its title after Queen Isabel II regularly visited in the 19th century. If you are staying in southern Spain it’s worth heading down to Gibraltar. You’ll feel like you have driven straight back to England when you see the red post boxes and signs in English. It’s British owned and has been described as ‘a piece of Portsmouth’. Head up The Rock to see the Barbary Macaques. If you’re staying on the north-east coast you can visit the Balearic island of Majorca. Take the ferry from Barcelona, Valencia or Denia from the mainland across to either Alcudia or Palma. 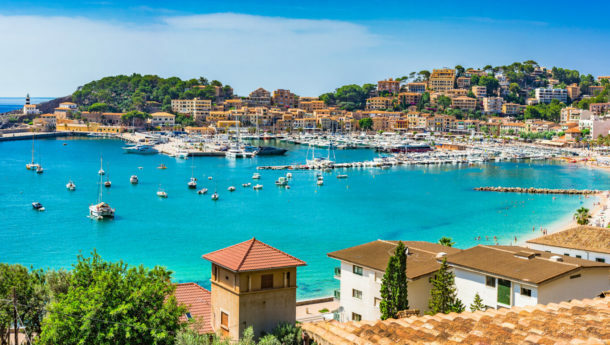 Visiting the Balearic Islands? It’s easy to travel between Majorca and Menorca. 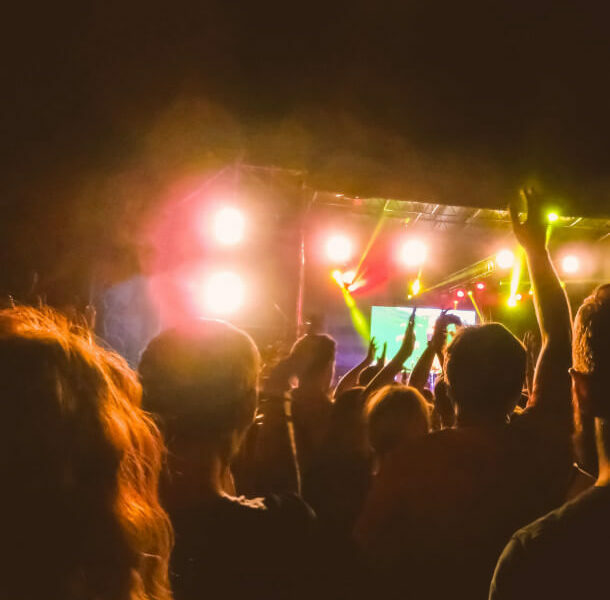 Alternatively, if you’re partying in Ibiza, it’ll take about 30 minutes by boat to reach Formentera to see beautiful beaches that have been likened to those in the Caribbean. Likewise, if you are on one of the Canary Islands, you can hop between Lanzarote and Fuerteventura or Tenerife and Gran Canaria. Tapas is Spain’s most famous food export. There are restaurants across the country dedicated to these small bite-size pieces that are perfect for sharing. Bread with aioli, patatas bravas, ham croquetas and pimientos de padron are all on the quintessential tapas menu. Seville, Granada and San Sebastian are the best places to try these delicious dishes. Similar to this is pintxos, however this delicacy is served on sticks and can be found in the Basque region. San Sebastian, sometimes dubbed Europe’s culinary capital, is the perfect place to head to try this. The coastal city has more Michelin stars, for its size, than anywhere else in the world. Spain is also the place to sample paella. This rice dish, which is cooked and served in a large round pan comes from Valencia and is made with meat, vegetables or seafood. To wash it all down you’ll want be drinking sangria. Dry Spanish red wine such as Rioja forms the base of this alcoholic beverage that is finished with rum, sugar, orange juice and fruit. You’ll find a similar drink in the south of Spain called zurra, this is mixed with peach or nectarine juice instead of orange. Spain is good for wine too, with a host of vineyards to visit. You can tour them in the La Rioja wine region before sampling the wine. The best nightlife in Spain can be found on the world-famous party island of Ibiza. The White Isle is paradise for clubbers with superclubs lining the coastline, enabling you to dance from dusk until dawn. On the west coast of this Balearic Island, you’ll find San Antonio. The home of Ocean Beach, Eden and Ibiza Rocks which has seen the likes of Craig David and Stormzy take to the pool-side stage. Over on the east coast, Playa d’en Bossa, is just a short distance from Ibiza Old Town. Superclubs including Ushuaïa and Hï host some of the world’s top artists and DJs. 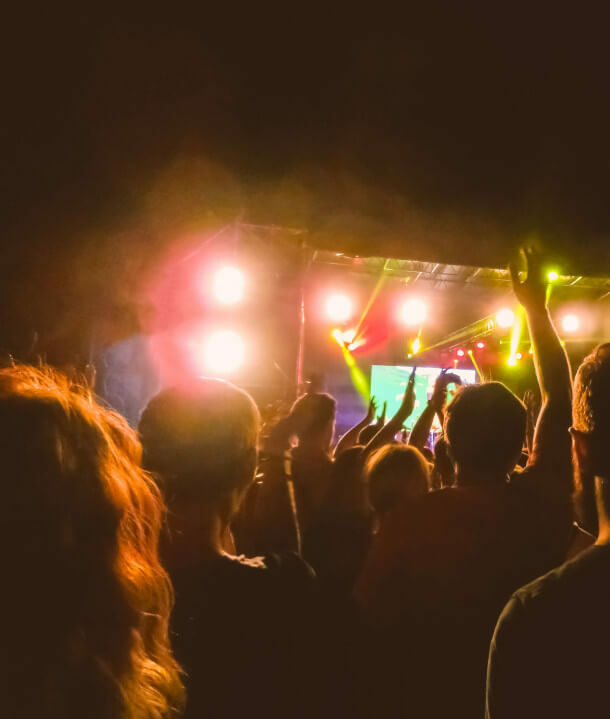 There are also a number of festivals in Spain including Benicassim, which sees more than 100 artists perform across the four-day event on Costa del Azahar. 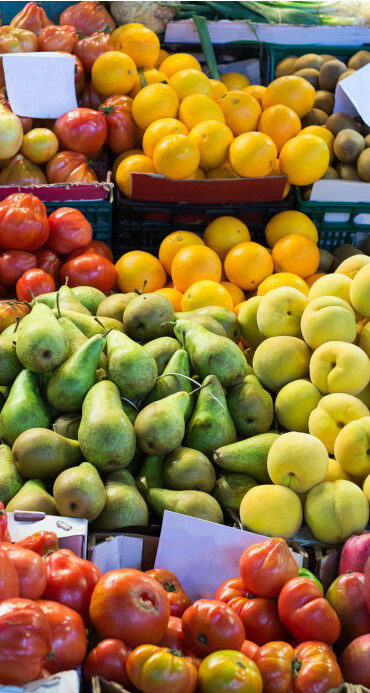 As a result of the hippy movement that Ibiza embraced in the 1960s, there are several hippy markets to visit. 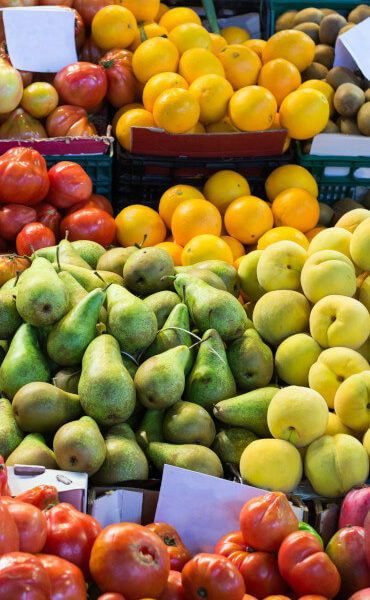 Punta Arabí Market in Es Caná is the biggest and oldest market on this Balearic Island, dating back to 1973. It boasts more than 500 stalls, selling crafts every Wednesday, from April to October. Las Dalias Market in San Carlos is one of the most popular. As you browse more than 200 stalls, DJs play in the background, offering a more laid back vibe that is still in keeping with its surroundings. As well as picking up souvenirs you can also relax with a massage and sample tasty local cuisine. Back on the mainland, head to La Rambla in Barcelona or the capital and home of Fashion Week, Madrid to find some of the best shops. Spain is the birthplace of the world’s most famous artists and is the ideal place to see their work. One of the most popular museums in Spain is the Salvador Dali Museum in Figueres. The surrealist artist, known for portraying his dreams and hallucinations, was born in this city. Today he is buried in the museum, which is described as ‘the largest surrealistic object in the world’. Over in Bilbao you’ll find the Guggenheim Museum. The sun shimmers off the steel and glass that forms this striking contemporary structure. The collection starts outside where there is a giant topiary dog called puppy and a Maman, a 30-foot bronze spider. Inside, you can see permanent and temporary exhibitions. In Malaga, the birthplace of Pablo Picasso, there are more than 30 museums and hundreds of pieces of his work display. If you head to Barcelona, you can visit the Museu Picasso, a permanent collection of close to 4,000 pieces. Meanwhile, Madrid boasts the ‘Golden Triangle of Art’, an area that is home to some of the most famous pieces in the world. This sunny destination is the perfect place to head outside and discover the adventures that await you. Kitesurfing, diving, surfing, canyoning and paragliding are just for starters on your Spanish bucket list. Spain’s highest peak, Mount Teide in Tenerife, is perfect for hiking. The 30-mile circumference of the volcanic crater dominates the centre of the island and the peak, 3,718 meters above sea level, is often snow-capped. The UNESCO World Heritage Site boasts an unusual lunar landscape that really does look out of this world. If you want to enjoy the view from the top without the effort, there is a cable car that will take you there. The Catalan Pyrenees offer the opportunity for skiing and snowboarding as well as hiking. This natural beauty is breathtaking and there are a plethora of hidden jewels to uncover while you explore. If you prefer to travel around on two wheels, Majorca has been described as one of the best places in the world for cycling. Hop on a bike and discover the varied terrain against the stunning backdrop. You won’t feel like you are still in Spain when you are in the Tabernas Desert which can be found in the south of the country in Andalucia. Many Hollywood films have been shot in this Wild West setting including The Good, the Bad and the Ugly. You can explore this area by 4×4, on horseback, hiking or on a camel. Spain is home to so many famous attractions. But, once you have explored some of the best, why not head off the tourist trail and see what else the country has to offer, away from the crowds. This castle looks like it has stepped straight out of a fairytale and it may well have done. It’s believed to be the inspiration for Cinderella’s Castle in Disney World. It can be found just over an hour from Madrid. A sea of sky blue buildings are intercepted by luscious greenery in Juzcar. 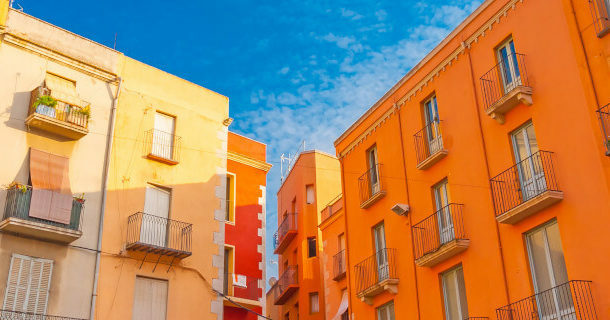 This town in Malaga wasn’t always blue, it was painted this colour for ‘The Smurfs’ film. Visitor numbers soared up when they left the white behind, which is why they decided to keep the brighter colour. Spain is the sunniest destination in Europe and boasts pleasant weather all year round. However, if you would like the warmer weather without the crowds, the best times to visit are April, May, June and September. The hottest and liveliest months are July and August. If you visit then, you may prefer to stay in the coastal resorts because it can get incredibly hot further inland. If you’re travelling on a budget, avoid the summer months. January and February tend to be the most affordable. Now you know what there is to do in Spain, you just need to decide whether you are going to visit the mainland or one of the beautiful islands.